CHEONGJU, South Korea, Sept. 12 (Yonhap) -- A monthlong international craft biennale will open in the South Korean city of Cheongju later this week under the theme of "Hands Plus Embrace." The 2017 Cheongju Craft Biennale, the 10th of its kind, will run from Sept. 13 to Oct. 22 in that city and will feature some 4,000 works presented by 780 teams from 18 countries. Cheongju is about 140 kilometers south of Seoul. 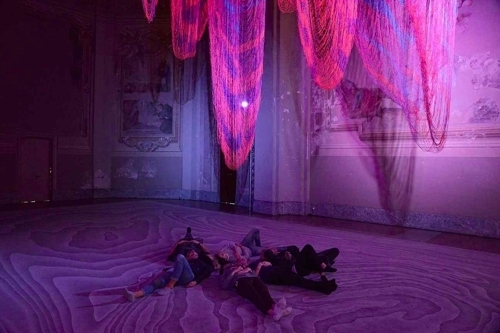 The festival's main exhibition, "Re-Craft," will be comprised of 669 digital craft works, including internationally recognized American sculptor Janet Echelman's "Line Travelling Through Space and Time" and British artist David Ogle's "Loomings." Notable this year is the organizing committee's decision to strike out the word "International" from the event's official title in a bid to further promote local culture to the world. As part of these efforts, the committee has also scrapped the post of general supervisor for the festival, and has appointed 11 artists, including poets, composers, film directors and architects, as co-supervisors. "We'll endeavor to develop the biennale into a world-class event based on regionality," the committee's secretary general Kim Ho-il said during a meeting with reporters Saturday. This year's theme was chosen as way to find common ground for communicating with the public as traditional crafts meet new genres and technologies, the biennale's website said. The Global Pavilion will showcase some 600 works by more than 300 artists from nine countries under different themes like "The Future of Craft" and "Craft in Daily Life." The biennale will also present a series of symposiums and workshops under such titles as "The Biennale of Yesterday," "The Future of Craft in the time of the Integration of Art, Science, Technology and Information," and "My Craft Participants." In addition, the event will showcase "Cheongju Digital Craft Lab," an education program to permit participants to experiment with LED lights, microcontrollers, sensors, and 3D scanners and printers.